Where has the time gone? As I write this it is July 29. My last article completed our too short of a visit to the Utah National Parks. We left Utah in late May. While there was a significant time gap between leaving Utah and getting that last blog post out, this has been ridiculous. I do apologize. The time between Utah and arriving in Yellowstone was relatively short, so it won’t take but a few lines to cover. Our next stop was Flaming Gorge. We took a day trip to the dam while still camped in Utah. 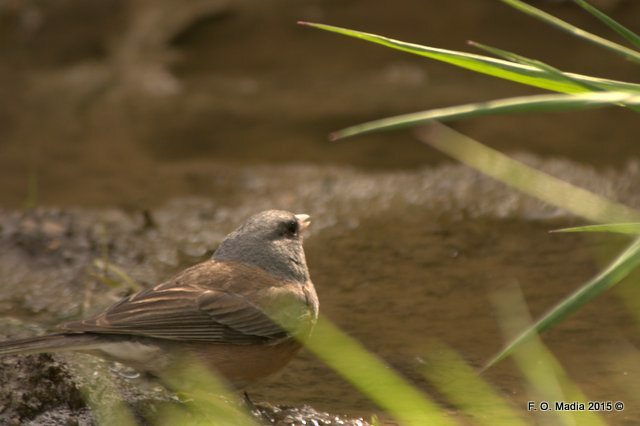 That was a wonderful day as the weather was a bit more cooperative than it had been and for reasons unknown to us there were few visitors at the dam upon our arrival. This is one of the few remaining dams in the country that allow tours of the interior of the facility. Since there were so few visitors, we found ourselves as part of a four person tour group. Our guide was quite knowledgeable and comedic making the tour interesting and entertaining. Our fellow tourists were also quite interesting. As we got to know them a little we learned that they were on a wonderful adventure which had started from their home in Arkansas. They were trying to see a lot this season. He is a retired RN and she is a retired IRS employee. Her stories were funnier than his. Anyway we traded a few stories and they pumped us for information regarding volunteering. Meanwhile the tour of the dam was really quite good. The physical structure is not huge by modern day dam standards, but it is one of the largest on the Colorado River system. The primary purpose of the dam is irrigation of farm lands. However, there are generators deep within the bowels of the dam that provide power to the grid. Of course the resulting reservoir is a destination for boaters and fishermen as well as campers desiring to just be near a large body of water. Our good friends Tammy and Ernie Cathay had volunteered at Flaming Gorge two years ago. I think Ernie was a little disappointed that we had not heard any stories about him and the law enforcement personnel he had worked with to keep the boaters in line. We forgot to inquire. I am certain there were countless stories to be heard. I thought I had been to Flaming Gorge as a child, possibly during my middle school or high school years, but I had absolutely no recollection of the area. It certainly isn’t one of those stops on one’s journey through life that is all that forgettable. As the day wore on the weather began to deteriorate. As a result, our exploration of the rim of the gorge was shortened a bit. However, we did stay in the area long enough to get out to the edge of the gorge near the visitor center. It was absolutely amazing to me to see the vertical cracks that exist near the edge. I am talking about wide cracks that extend away from the edge 20 to 30 feet that are large enough to lose a small person in. Even more amazing is the fact that there are few signs of erosion. It is as though the final formation of the gorge was just a few years ago. Of course that is not the case, but the arid nature of the area along with the substantial hardness of the rock and a wonderful layer of topsoil supporting hardy vegetation seems to have frozen geologic time in the area. I have no photos to share. Now is probably as good a time as any to share a secret I carried with me along this entire journey. I left my camera’s battery charger at home. My system does not allow charging the camera via a USB connection from, say, the computer. There is a handy DC input connection on the camera, but the camera did not come with the appropriate cable to make a connection. Since I had the AC charger for the batteries, I never gave a thought to needing a DC charging cable. I may have to rethink that policy. Anyway, I have two batteries for the camera. The one I started the trip with had been in use for a good long while before we left home. It had less than half a charge on it as we left. It went dead fairly early in the trip. When I put the spare in, I looked for the charger so I could get the first battery ready for use. The charger was nowhere to be found. I was panicked, so I sent a text message to Dawn Hesalroad, our neighbor, super star house sitter, and even better good friend. I asked Dawn to look in the office of our house for the charger. I indicated where I thought it would be and sure enough that was where she found it. My instructions to her had her send it to our park address as I was afraid we were too much of a moving target to try for anywhere along the way. Now, I was getting a little nervous. I broke out the manual for the camera and read up on how many images one can make on a fully charged battery. From that point forward I was really much more careful than usual about how many photos I took at any one place. I was feeling I would have to get all the way to Yellowstone in order to get my charger to meet up with me. With that in mind, I knew that snap shots were out of the question. I wanted to build on my “professional” portfolio while on this trip, so I had to concentrate on those sorts of photographs that might be of some value to someone other than this older fellow’s memory jogger. As a result, I think I left a lot of photographs not taken either because the weather wasn’t too wonderful, or there were too many shadows, or I just couldn’t get the composition correct. Under normal circumstances I will end up with several mediocre images of a given subject on my computer. Sometimes I am just trying to get an image of something, usually a bird, so we can work on identification later. I also take several photographs of flowers in order to get the leaves, the stems, the larger plant structure as well as the blossom with enough detail to aid in identification. Normally what gets published on this blog is the best of the best which generally lacks most of the features required for an accurate identification. 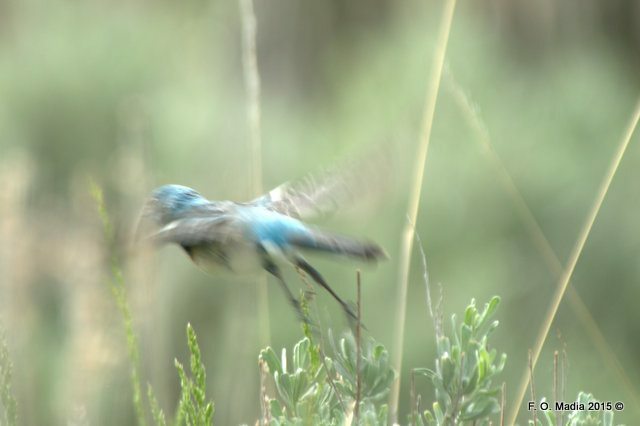 Birds in flight consume numerous shutter cycles, each eating a little more battery reserve. At my present level of proficiency at capturing birds in flight, I am lucky to get one out of 20 or 30 exposures that is in focus and properly framed. I mention all this as a prelude to what will follow. The next several days of this journey have many fewer than my normal number of photographs documenting our presence. That said, our next few days were spent in southwestern Wyoming. I have another wonderful cousin who lives in Evanston, Wyoming. While we wanted to try to get together with Dave and his beautiful wife, Patsy, our chosen route would not take us through Evanston. So, we started trying to touch base with Dave while still in Utah. Dave didn’t recognize my Florida telephone number, so didn’t immediately return my call. I don’t often return calls to Florida either (except Pat’s). Anyway, we ended up in Rock Springs which is not all that far east of Evanston and would have allowed for a meet and greet in Little America nearly halfway between the two towns. After my second attempt to reach Dave, he decided that maybe he might know this person from Florida, so he listened to the voice mail and returned my call. Unfortunately we were not able to meet up due to a dental appointment Dave had in Salt Lake City, Utah. Maybe next time. 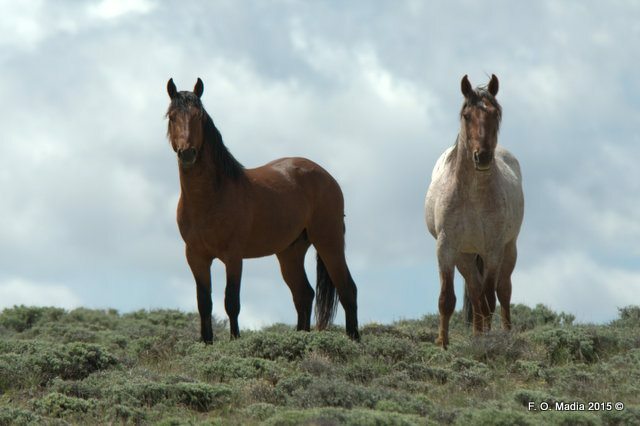 While we were in the Rock Springs area, we took a drive around to where wild horse herds roam to the north of town. The drive was along a well maintained gravel road that seemed to go forever. Several miles into the ride we found another family heading the other way. By this point we had seen no horses. They had and they let us know where they were last seen. As luck would have it, we were able to find a reasonably sized herd way off in the distance. We watched them for a while, and then continued on. To our delight we then found two horses that were quite near the road. 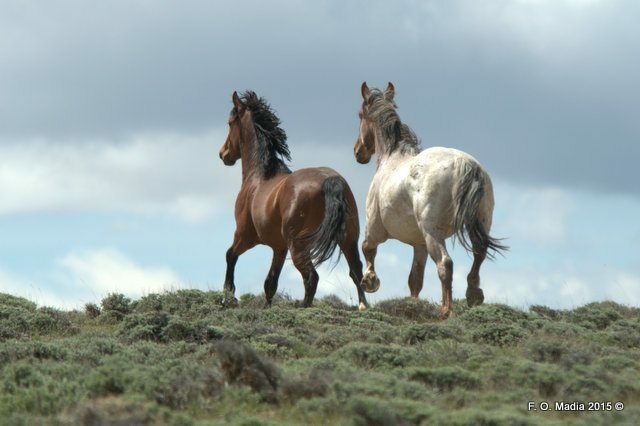 I was able to get a few good shots of them before they galloped over the ridge and out of view. By choosing to travel north through Wyoming instead of heading west and back into Utah before turning north, we were now about a day ahead of our reservation in Gardiner, Montana. 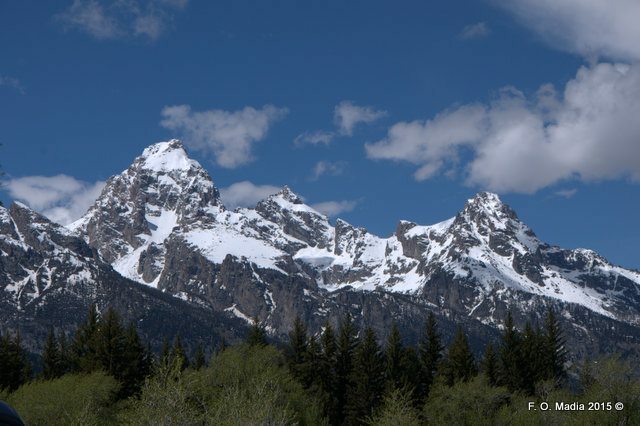 With that in mind we decided to try to visit Jackson, Wyoming. The drive from Rock Springs to Jackson would be a stretch for a one day journey, so we decided to stay in Dubois, Wyoming and daytrip to Jackson. What a wonderful decision that was. First, we found a great little RV Park with cabins and a motel just outside Dubois. Second, we found a wonderful restaurant in Dubois. Since we were a bit ahead of the tourist season there were not a lot of dining choices. In fact we ended up eating at the same place both nights we were there because the only other restaurant open was not at all appealing to either of us. West of Dubois is Togwotee Pass. Soon after crossing over the summit visitors get their first view of the Grand Tetons. I have made this trip more times than I can remember going back to the summer of my thirteenth year. I never tire of seeing these magnificent mountains from this vantage point. I would not be disappointed on this day. As we rounded the corner and the mountains came into view I could see that there was a significant cloud bank hanging over the Snake River giving the appearance of the mountains floating above the river. It was truly one of the iconic views of these magnificent peaks that many photographers wait a lifetime to get. We were there, the view was there, I was excited. I took both tripods, my long lens along with my short lens and of course my camera. I knew that time was limited as the fog never lasts long and the illusion would be fleeting. I got all set up and framed the scene and eased down the shutter release and absolutely nothing happened. I checked to make sure I wasn’t in some sort of delayed shooting mode. Made sure the lens was properly attached. I even turned the camera off then on in hopes something good would result. Although the battery indicator indicated I still had power, I managed to convince myself that I had pushed my battery luck too far and I was now being punished by said battery for not making sure my charger was on board before leaving Texas. By now, I was pretty well unsettled and not thinking very clearly. As I looked over the camera to the scene that would go unrecorded I noticed that the scene had faded and although the mostly snow covered peaks were still there, the shot I wanted was no longer available. Somewhat dejected I began to break down my gear. There were others there at the time taking photos with smartphones. One commented on what a great set of photos I must have gotten with my gear. Little did they know. We continued into Jackson. While there I stopped in at the one and only camera shop and inquired as to a charger for my specific batteries. The only charger they had was a universal charger and they wanted more for it than I was willing to pay since my charger was likely 150 miles up the road at the Mammoth Post Office. Over lunch Connie and I discussed what to do about this dilemma. We decided to check out the local Radio Shack. Sure enough they had a universal charger that beat the one from the camera shop in that it also included a 12 volt DC option and was just about half as expensive as the other one. Bingo, I was only minutes from being back in business. We bought the charger, plugged it into the car DC port and started charging one of my batteries as we drove back into Grand Teton National Park. By the time we go to Moose, I felt I had enough of a charge to return to photography. By now I had over half a charge on the battery. However, when I tried to take a photo again nothing happened. Since I was not trying to get an image of a rapidly changing scene as I had been early in the day, I was now able to recognize that there was an icon blinking I had not noticed earlier. I was unfamiliar with this icon. As it turns out the SD card was improperly seated and the camera, being smarter than me, would not allow me to take a photo that would not appear. So, how can you improperly seat and SD card in a good camera. I still don’t know the answer. The card only goes in one way and it clicks into place. However, after removing the card and reinserting it I was back in business. I was able to get a few good images of the Tetons as we made our way back towards Moran Junction. We had a great rest of our day in Grand Teton National Park. When we got back to Dubois we had another superb dinner at the same great restaurant. We met a wonderful couple who like us seem to dabble in photography as a paying hobby. That fact made for some interesting conversation as we waited for tables. By the next morning I had two fully charged batteries and was hoping to get some great photos as we made our way towards and through Yellowstone. Alas, as we topped the divide and made that turn prior to the first view of the Tetons, I found myself holding my breath in hopes we would get another chance at the floating mountain view. No such luck. I guess we will have to try again next spring. One of the reasons we were ahead of our travel plan was that we had been texting our great friends, Chuck and Diane Haferman since somewhere in Utah. They were on a cross-country adventure of their own and would be crossing the continental divide about the time we would be in the vicinity. After several text messages trying to pin down when and where we might get together we finally decided it would be best to meet in Gardiner, Montana. As it would turn out, we were possibly in Jackson during the same 24 hour period, but probably not at the same time. Chuck and Diane were both working at Tripler Army Hospital when we arrived in Hawaii in 1982. Chuck was a Major in the Army and a nurse. Diane was a civilian employee in the same unit and Connie was a civilian nurse in the unit as well. We became friends then and have remained close in mind if not in miles for 33 years. Over that time we have found one another in a few strange places. Connie and I had taken a trip to Germany while we were stationed in Scotland. While there we visited the German Olympic training camp and signed up to ride luge sleds down the luge course (don’t’ ask). Chuck and Diane were visiting at the same time. Chuck took some great photos of us and our friends sliding down the course. This was before cell phones and the internet. Our meetup was purely accidental. It is much easier to keep up with these and other friends due to Facebook and other modern means. We had last seen Chuck and Diane in 2010 when we spent several days camped in their driveway. We had a great time catching up and seeing a little of what Yellowstone has to offer together with this great couple. We spent the next week staying at an RV Park in Gardiner, Montana while we waited to move to Indian Creek Campground and our fifth season working as volunteer campground hosts. During that week we met with our good friends George and Cathy Van Der Aue from Connecticut. They were in the park with other friends of theirs. We tried to help arrange their itinerary so they could make the most of a birding tour of the park. 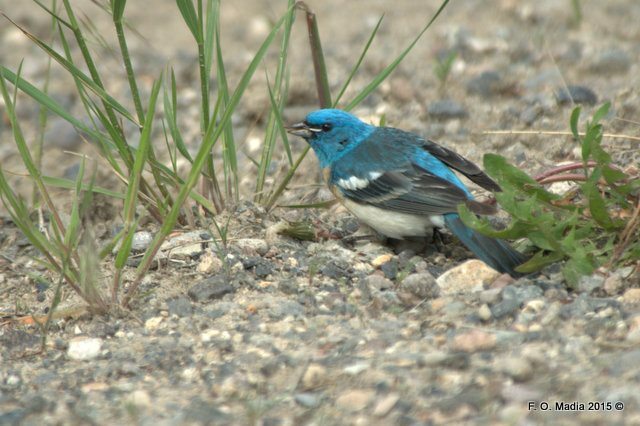 They were quite successful in finding many of the birds that either live in the park or visit during the spring and summer. We have known Cathy and George since our very first trip to Glacier National Park in the early 2000’s. We were cabin mates in a one room cabin while taking a Nature Journaling Workshop from another mutual friend. Since then, we have stayed close to this wonderful couple and have met up with them on many occasions in many locations. It was great seeing them and getting caught up with their lives since our last get together. Of course Connie and I went into the park most every day while we were relaxing in Gardiner to see what we too could see. Here are a few of our early sightings. In my next installment I will share some of our adventures since opening the campground. Stay tuned. We loved seeing you in your summer home and thanks so very much for helping us locate those birds that made our trip so birdy. Enjoy this beautiful summer! 33 years….!? It was great seeing you two in Gardiner and the texting chase was fun. I was hoping we would actually be passing you on the rode as we made our way there. Our next road trip will be to Glacier Park and we are hoping there’s a crossroads on he way where we can meet. Well keep in touch. Ohhhh, nice shots of the horses, Frank! I love them best. And the clear spring day is stunning. Good work, sir!! Fantastic pictures…….the Tetons and the horses stole the show, although the bird shots were terrific, too. I don’t know which I enjoyed more…your descriptive writing or amazing photos. The wild horses galloping away were fantastic. The close-up of the black bear was frighteningly close! 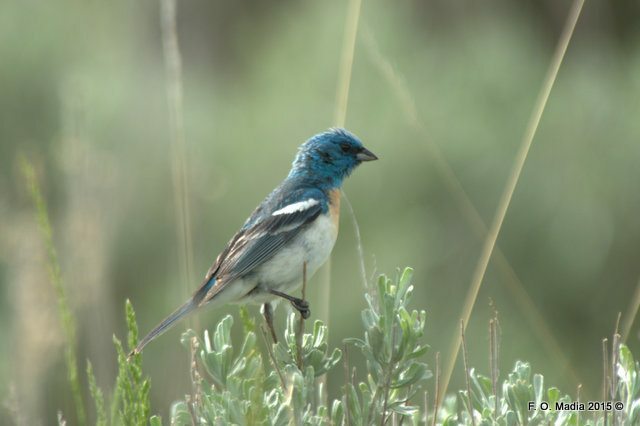 The snow-on-the-mountain photo was breath-taking, as was the picture of the lazuli bunting. I loved and could relate to the saga of the once-in-a-lifetime shot you missed. 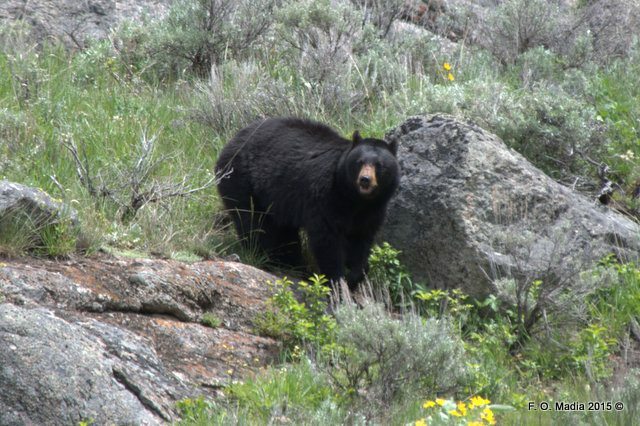 Just to ensure there is no confusion regarding the bear photo – While I may have been just inside the 100 yard limit the park requires, I was on the opposite side of the road and car of the bear. My door was open making for a quick escape if required. The bear was not interested in any of the few people present. In fact as the third part of the rule regarding distance from wild animals requires, our presence did not cause the animal to alter its natural behavior. At the time it was browsing for food pretty much oblivious to us. It has been and will continue to be my habit to give these animals their space and to not disturb them while enjoying their presence. Much has been said in recent weeks about people approaching animals and getting hurt or even killed for their actions. 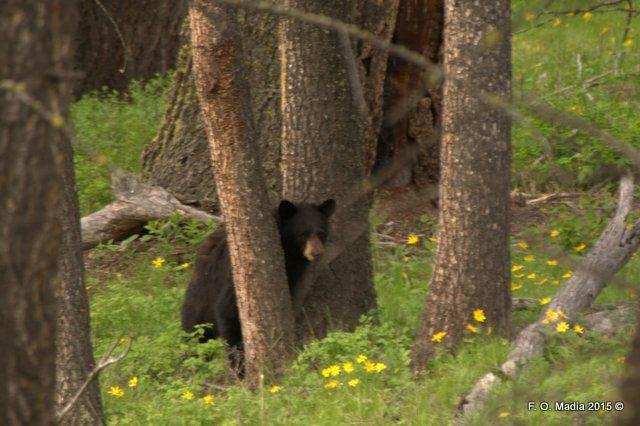 From my perspective the practice of stalking wild animals in order to get a better photograph is not only dangerous, it is disrespectful to the animals, the park service and other visitors. After reading your most interesting stories and seeing the wonderful photography, I feel as though I have been on a vacation. Thank you for sharing your talents. Always enjoy!!! Looking forward to the return of you guys!